Kimberlites at the Sloan Ranch in Colorado are diamond-bearing and occur within the State Line district. Two of the Sloan group (1 and 2) have produced some of the better kimberlite specimens in the world. diamondiferous kimberlite in Larimer County, Colorado. Bernie Free poses. 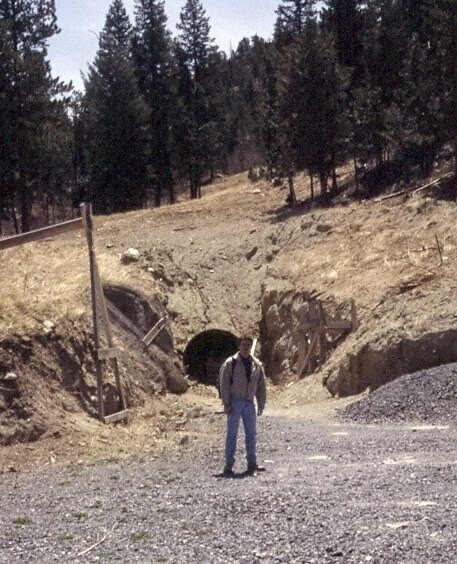 On Sunday, May 19th, 1996, the 1996 Industrial Minerals Forum was led by geologist W. Dan Hausel, to the Sloan Ranch in the southern portion of the Colorado-Wyoming State Line diamond district to examine two of six diamondiferous kimberlite intrusives within the Sloan cluster. These two intrusives: Sloan 1 and 2 pipes are just two of the more than 40 known diamond-bearing kimberlites in the Colorado-Wyoming State Line district (McCallum, 1991). In addition to these kimberlites, several large clusters of cryptovolcanic structures containing rounded boulders and cobbles, carbonate-rich soil and montmorillonite clay were recently identified in 2007 and 2008. 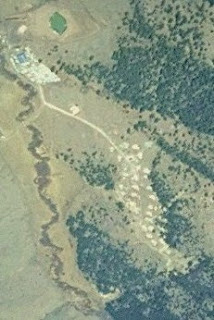 The kimberlites are visible on GoogleEarth at 40o50'38.74"N; 105o27'20.97"W. More than a hundred cryptovolcanic structures were found in this region by the author suggesting a presence of many undiscovered kimberlites. Since every kimberlite in this district has yielded diamonds, this district should be explored in much greater detail! To the north, the author also identified about 200 similar anomalies that are likely kimberlites in the Twin Mountains, Lost Lakes, Vadawuoo and other areas. Total diamond production from the State Line district,included nearly 140,000 diamonds. The diamonds ranged from microdiamonds to a 28.3 carat gemstone (Hausel, 1998; Erlich and Hausel, 2002). Cumulative production from the Sloan 1 and 2 kimberlites totaled 39,616 diamonds, or about 1/4 of the total production in the district. The Sloan diamonds ranged from microdiamonds to a 5.51 carat gemstone (Hausel, 1995). These diamonds were all recovered during bulk sampling in the 1990s. Bulk samples recovered from the Sloan property ranged from 0.01 to 0.60 carats/tonne (Hausel, 1998). the Sloan 1 diamondiferous kimberlite. 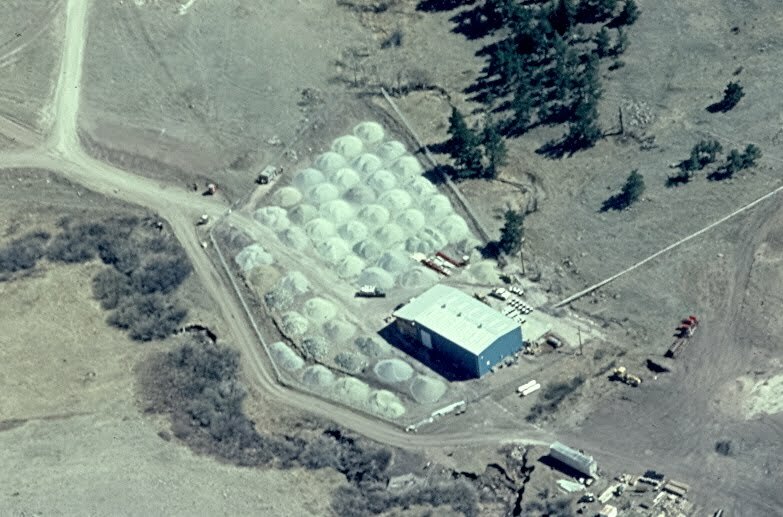 Permission was granted to the 1996 Industrial Minerals Conference to visit the Sloan Ranch kimberlites by Frank Yaussi, Prairie Divide Corporation, and Cominco American Incorporated. 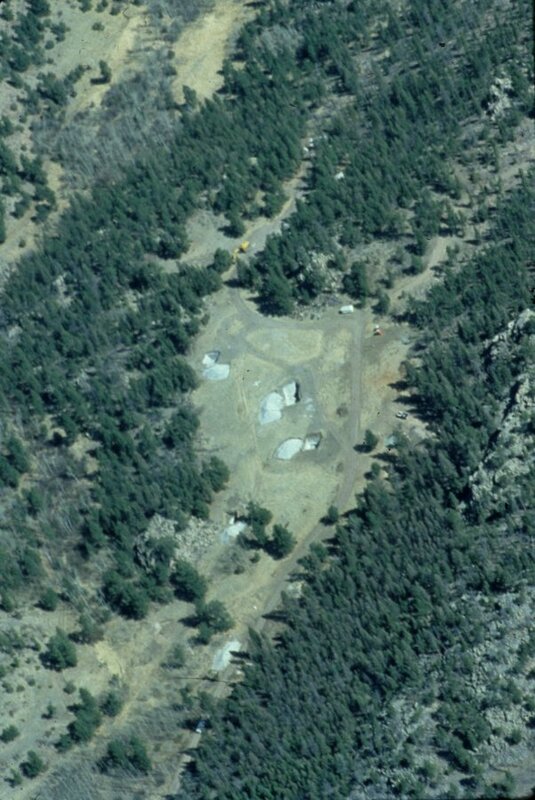 The kimberlites are located in the S/2 section 10, T10N, R72W in Larimer County, Colorado, at an elevation of about 7,250 feet. The pipes can be reached from U.S. Highway 287 which runs between Laramie and Fort Collins. From Laramie, the pipes are accessible by driving 40 miles south along Highway 287 to the Larimer County Road 80C (Cherokee Park Road) turnoff. From that point, travel west 8 miles to the Larimer County Road 82E junction. Turn left on County Road 82E and continue west another 4.5 miles. The pipes lie south of the county road adjacent to a large, blue, metal building which at one time housed the Superior Minerals and later the Dia Met processing facility. Equipment from the mill was apparently moved to Canada at the end of the 20th Century. To access the property, permission is needed, although one can view the kimberlites from the County Road. This field trip summary is an overview of several publications listed in the references cited section at the end of the paper and summarizes the activities of the International Field Trip conference in 1996. Diamonds were discovered in the Colorado-Wyoming State Line district in 1975. The lack of historical discoveries in this region is curious especially when one considers the district hosts several deeply eroded diamondiferous kimberlite intrusives. And in all probability, some drainages in the district contain considerable placer diamonds due to significant portions of the upper one to two thousand vertical columns of the diamond pipes in this region being eroded over the past 60 million years. The lack of historical placer discoveries may be due to two reasons. (1) The "1872 Great Diamond Hoax" was located just 180 miles due west of the State Line district (Hausel and Stahl, 1995). The "hoax" was of such magnitude that few people would have believed diamonds could be found anywhere in Colorado or Wyoming for decades to come. (2) Much of the State Line district is underlain by relatively unmineralized granite, thus very little gold prospecting has ever occurred in the district. 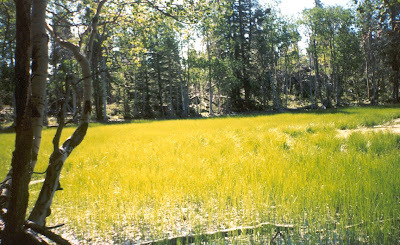 The general lack of placer gold activities probably contributed to the lack of placer diamond discoveries. characteristics of kimberlite (cryptovolcanic) pipes. formed by stand of trees that mark a deep fracture. Kimberlite was first identified in this district in 1964, by Dr. M.E. McCallum from samples collected from a small terrazzo quarry along the western edge of the Sloan 1 diatreme. Diamonds were later discovered in 1975 during routine thin-section preparation of a serpentinized garnet peridotite nodule collected from the Schaffer 3 kimberlite in Wyoming. During the preparation of the section, Florian Nowacki and Ross Jensen of the U.S. Geological Survey noted deep scratches were cut into a carborundum grinding plate. Upon examination of the nodule, a small white crystal was isolated that was confirmed as diamond by x-ray diffraction analysis by T. Botinelly and B.F. Leonard of the U.S. Geological Survey. Other small diamonds were subsequently recovered from this nodule (McCallum and Mabarak, 1976). However, Frank Yaussai (personal communication) reported finding several diamonds in Rabbit Creek while prospecting for gold. He also indicated samples of kimberlite mined from the Sloan quarry scratched a carborundum wheel owned by the Cheyenne Tile and Terrazzo Company during polishing of the material for use in the Cheyenne airport. It was also indicated that Dr. Arnold Waters, Jr., chief geologist for DeBeers, applied for a lease on the Sloan property following the processing of a small bulk sample recovered from the Sloan 1 kimberlite sent to South Africa for processing. 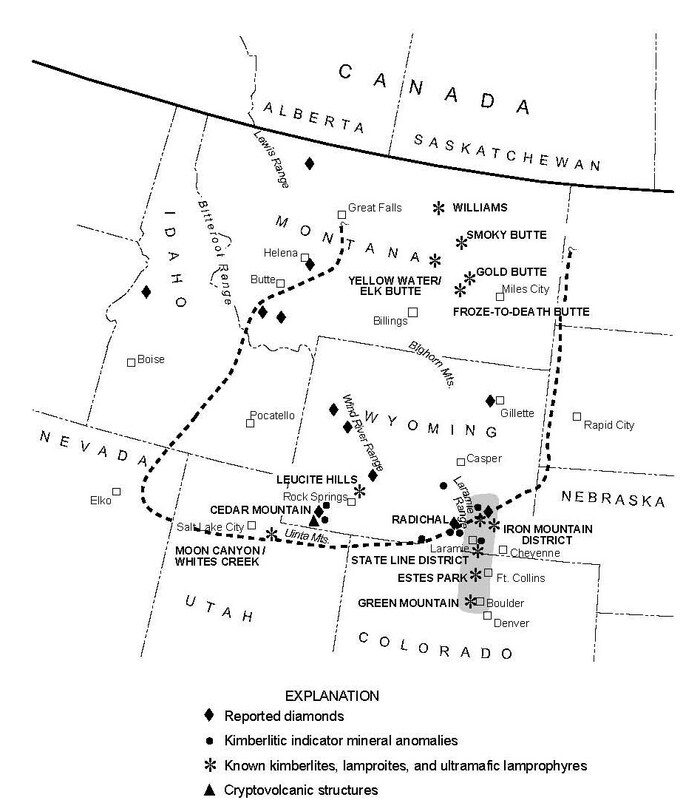 These events all took place prior to the 1975 announcement of diamonds found in Wyoming, but were not published nor were the pre-1975 diamonds verified. 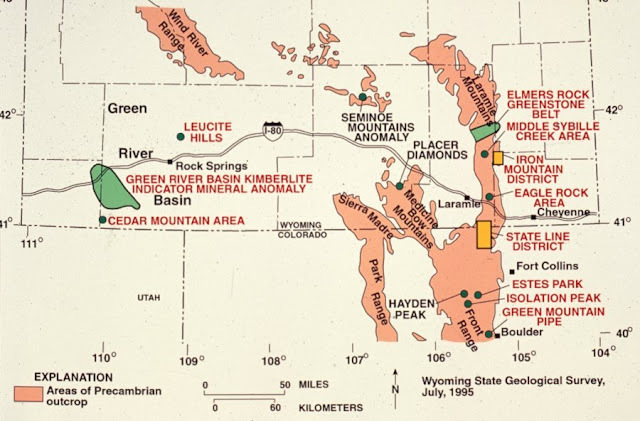 Commercial interest in the Colorado-Wyoming State Line district was later initiated in 1979 after the State of Wyoming, in cooperation with Rocky Mountain Energy Company (Union Pacific), issued a call for exploration proposals for the Wyoming portion of the State Line district. Cominco American Incorporated submitted the successful bid and explored the Schaffer and Aultman kimberlites in Wyoming. The results of bulk sample tests by Cominco American were discouraging as only subeconomic grades (0.5 to 1.0 carats/100 tonnes) were detected. The largest diamond recovered in these tests was a 0.86 carat gemstone. 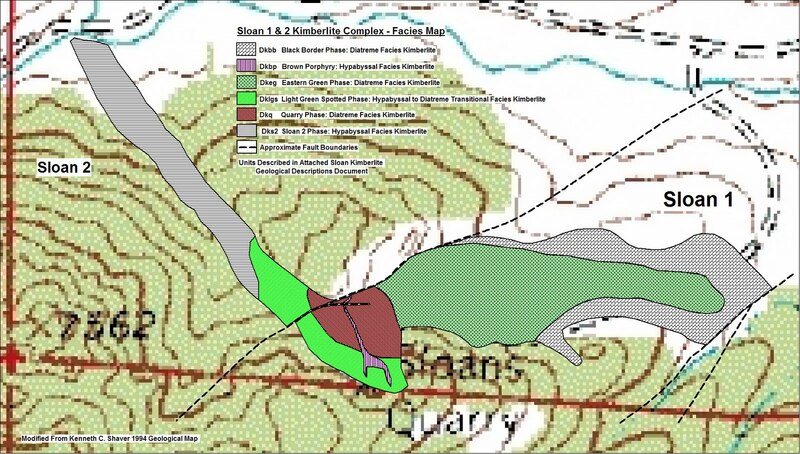 Interest in the Sloan 1 and 2 kimberlites was initiated by Superior Minerals in the following year in 1980. This was followed by a Superior-Lac joint venture in 1983, and in 1984, the property was quit-claimed back to the owners. This latter event coincided with a scheduled advanced royalty payment, and the purchase of Superior Minerals by Mobil Oil Company. Mobil eventually disposed of all of Superior's mineral interests while Lac Minerals was entering into litigation in Canada concerning its control of the Hemlo Gold mine (Oliver, 1990). In 1994, Royalstar Ltd. drove a 700-foot adit into the Sloan 2 kimberlite to test for economic mineralization. In 2006, DiamonEx Ltd of Brisbane Australia, leased the property with the plan of sampling the property and recovering a large parcel of diamonds for valuation. 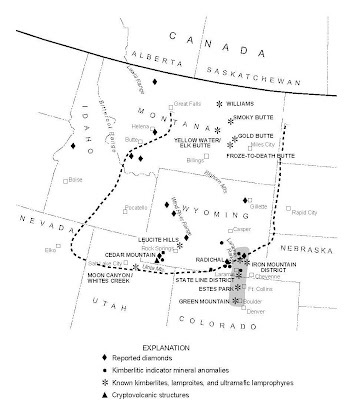 At about the same time (2006-2008), exploration by DiamonEx resulted in discovery of a few hundred cryptovolcanic (kimberlite-like) anomalies and kimberlitic indicator mineral anomalies in the Colorado and Wyoming region. The available data suggested possibility for commercial diamond mineralization at the Sloan Ranch depending on the price per carat. Thus it was the intention of DiamonEx to determine a value per carat and ore grade and attempt to place a small gemstone operation in production to recover diamonds, Cape Rubies (pyrope garnet), Cape Emeralds (chromian diopside) and specimens if the diamond value showed the property to be economic. The concept included searching for additional commercial pipes and placers while the Sloan kimberlites were being mined. However, the economic collapse of 2009 took its toll on the DiamonEx and company operations ceased in Colorado, Wyoming and Botswana. The Colorado-Wyoming State Line district lies within the southern Laramie Range of Wyoming and continues south into Colorado along the eastern flank of the northern Front Range (Figure 1). Geographically, the Laramie and Front Ranges are a continuous mountain range. 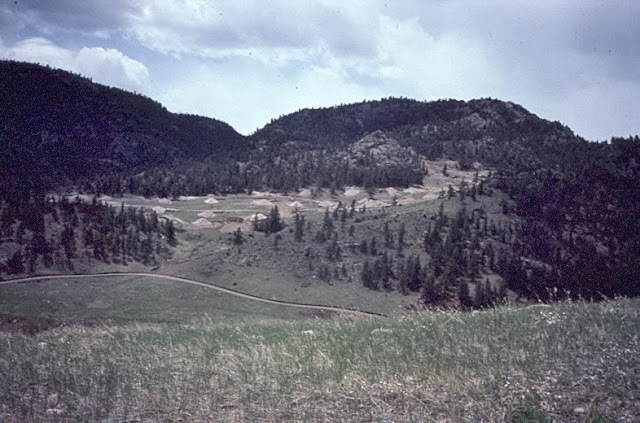 This range was uplifted during the Laramide orogeny and its core was exposed following several million years of erosion. The core of range in the vicinity of the State Line district consists of Proterozoic crystalline rock. The Proterozoic basement continues north, where in the vicinity of the Sheep Rock area, the Cheyenne Belt separates the Proterozoic basement from an Archean basement farther to the north. The Archean core consists of Archean gneisses, schists and granites of the Wyoming Province. Thus in terms of cratonic environments, an Archon lies north of the Cheyenne Belt, and a Proton consisting of a Proterozoic mobile belt, lies to the south. Precambrian exposures in the vicinity of the State Line district consist of 1.9 to 1.7 Ga metamorphic rocks of the Colorado Province that are disconcordantly intruded by 1.4 Ga granitic rocks. The metamorphic rocks are amphibolitic, quartzofeldspathic, and pelitic gneisses and schists (McCallum and others, 1977) that are part of a island arc succession which collided with the Archean craton of the Wyoming Province nearly 1.7 Ga ago. This collision boundary is marked by a major suture referred to as the Cheyenne Belt (Karlstrom and Houston, 1984). Even though the district lies 50 to 70 miles south of the Wyoming Province, Shaver (1988) suggested that the Proterozoic rocks of the Colorado Province may have thrust over the Wyoming Province and an Archean fragment may lie at depth in the district. The dominant regional structure in the district is the Virginia-Dale ring dike complex, a circular granitic pluton of nearly 9 miles in diameter. The ring-dike intrudes 1.4 Ga Sherman Granite and the older metamorphic rocks (Eggler, 1968). The complex is interpreted as a phase of the Log Cabin batholith located to the south. pipes recently was reported to have yielded two diamonds). The only post-Precambrian rocks found in situ in the district are arkosic sedimentary rocks of the Pennsylvanian Fountain Formation (McCallum and others, 1979). In situ Lower Paleozoic rocks do not occur in the district, although some Cambrian, Ordovician, and Silurian sedimentary xenoliths are found in some kimberlite diatremes. It was the presence of these sedimentary xenoliths that first attracted the curiosity of geologists to the diatremes in the early 1960s (see: Chronic and Ferris, 1961). The age of the kimberlites in the Colorado-Wyoming kimberlite province, which extends as far south as Boulder, Colorado, and as far north as Sybille Canyon in the central Laramie Range (Figure 1), were assumed to be early Devonian based on the presence of Paleozoic xenoliths in some of the intrusives. Fission track dating of sphene (Larson and Amini, 1981) and zircon (Naesser and McCallum, 1977), and Rb-Sr dating of phlogopite (Smith, 1979, 1983) has since established a late Devonian age for many of the kimberlites. 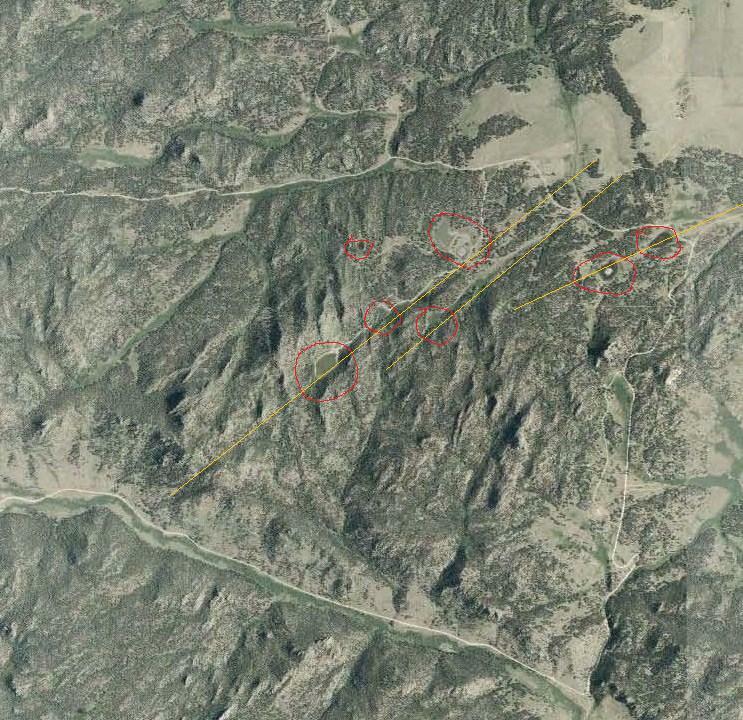 The Green Mountain pipe located 50 miles south of the district near Boulder, Colorado, recently yielded paleomagnetic, K-Ar, Ar40-Ar39, and Rb-Sr ages between 600 to 700 Ma. Additionally, Ar40-Ar39 and Rb-Sr data also indicate a Proterozoic age for one of the Chicken Park kimberlites located in the district, just five miles west of the Sloan kimberlites (Alan P. Lester, written communication, 1996). These dates provide further evidence of the several episodes of kimberlite and lamproite magmatism in the Wyoming craton (Hausel, 1996) [the Wyoming craton is here defined to include both the Wyoming Province (Archon) and the Colorado Province (Proton)] (Figure 2). and lamproite occurrences, districts, and related rocks. Kimberlites in the region occur as diatremes (pipes), related plugs or blows, and dikes. Intrusive breccia (tuffisitic kimberlite breccia) predominates in the diatremes, whereas massive porphyritic kimberlite (hypabyssal facies) is dominant in dikes and blows. Kimberlite is typically intensely serpentinized, carbonated, and locally silicified and/or fenitized (McCallum and Eggler, 1971; Smith and others, 1979). Diatreme facies kimberlite consists of abundant subrounded to angular rock fragments along with serpentinized macrocrysts of olivine and lesser enstatite, Cr-rich and Cr-poor pyropic garnet and diopside, picroilmenite, clinopyroxene-ilmenite intergrowths, and phlogopite in a finely crystalline matrix of serpentine, carbonate, olivine, diopside, picroilmenite, phlogopite, perovskite, magnetite, Cr-rich spinels, hematite, apatite, and zircon (Rogers, 1985; McCallum, 1991). outlined by previous operators and would have made an excellent diamond mine. Hypabyssal facies kimberlite occurs in dikes, sills, and small plug-like bodies that most likely represent root zones of deeply eroded pipes. Kimberlite and kimberlite breccia both occur, although kimberlite breccia is common only locally. Xenolithic fragments rarely exceed a few percent (unlike the diatreme facies) and are typically moderately well-rounded upper mantle and lower crustal nodules. Aphanitic hypabyssal kimberlite devoid of macrocrysts is rare. The mineralogy of the hypabyssal kimberlite is essentially the same as for the diatreme facies. However, globular, emulsion-like segregations of serpentine and calcite are more abundant in hypabyssal types (Rogers, 1985). The State Line district has been truncated by late Tertiary to Pleistocene erosion. The kimberlites are generally poorly exposed, have negligible relief, and are deeply weathered. Geophysical surveys suggest weathering continues to depths of at least 100 feet below the surface (Hausel and others, 1979), although moderately fresh exposures are present at some sites. Most kimberlites are covered by alluvium and or colluvium, and some have been recognized by the presence of grey, weathered ("blue-ground"), kimberlitic soil that is commonly associated with lush, grassy, vegetation, animal burrows, and/or cliche. Other sites are recognized by the presence of Lower Paleozoic xenoliths as well as mantle and lower crustal xenoliths and nodules of peridotite, pyroxenite, eclogite, granulite, and/or megacrysts of pyrope, ilmenite, or diopside (McCallum and Eggler, 1979). 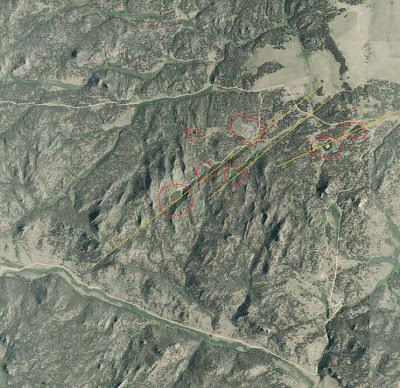 The Sloan cluster consists of six kimberlites near the southern margin of the Colorado-Wyoming State Line district (Figure 3). The field trip attendees will visit only the Sloan 1 and 2.
recent discoveries of cryptovolcanic structures). The Sloan 1 consists of diatreme-facies kimberlite, and the Sloan 2 consists of hypabyssal- and transitional-facies kimberlite (Shaver, 1994). 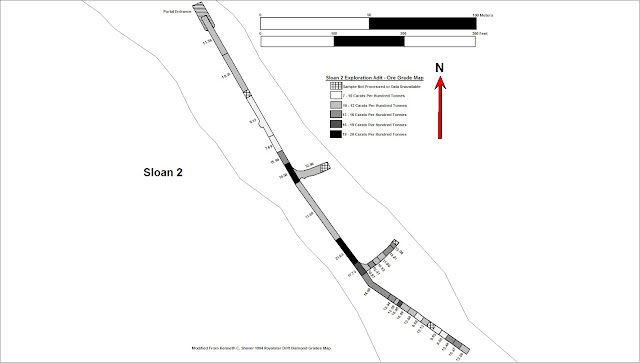 The Sloan 1 has an aerial extent of 500 by 1,800 feet while the Sloan 2 is 200 by 2,000 feet. These two pipes have yielded a significant number of subcalcic 'G10' harzburgitic pyropes (McCallum, 1991) (author's note: Many peridotitic garnets found in kimberlite have been designated as 'G10' or 'G9'. These were derived from the peridotite xenoliths sampled by the kimberlite during ascent from the upper mantle. The peridotites are Cr-rich ultramafic rocks with olivine (>40%) and pyroxene and minor plagioclase that are subdivided on the basis of pyroxenes. For example, lherzolites are peridotites that have both clinopyroxene and orthopyroxene. Wehrlites contain clinopyroxene but lack orthopyroxene. Harzburgites have orthopyroxene but no clinopyroxene. Diamonds are found in some garnet peridotites. Most peridotitic diamonds occur in garnet-bearing harzburgite: diamondiferous pyrope-lherzolites are uncommon. Pyrope garnets from disaggregated peridotite have been designated by Gurney (1989) as either 'G10', derived from low-Ca garnet harzburgites, and 'G9' derived from the more calcic lherzolites. This suggests that a kimberlite with abundant 'G10' pyropes should be predicted to be diamondiferous as long as the magma was reducing. Reducing conditions can be predicted on the basis of MgO:Cr2O3 ratios of picroilmenite. The ratios provide an indication of the oxygen fugacity and the favorability of diamond preservation. In addition to G10 garnets, eclogitic garnets also are important in appraising the diamond potential of a kimberlite. Eclogitic garnets with Na2O contents >0.09% are indicative of a diamondiferous source terrane). of the better samples in the world have been collected here. 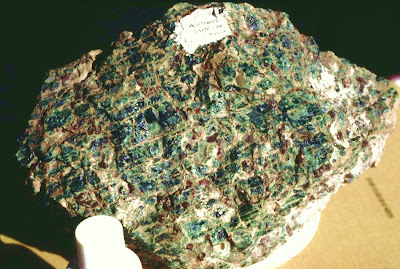 A significant number of peridotitic garnets from the Sloan 1 and 2 kimberlites were reported by McCallum and Waldman (1991) to be subcalcic chromian garnets with G10 compositions indicating a low to moderate grade of diamonds from a harzburgitic source. The TiO2:Na2O plots for the eclogitic garnets indicated a low potential for a eclogitic diamond source. Ilmenite Cr2O3:MgO compositions indicated that reducing conditions prevailed in the kimberlite magmas suggesting that diamond preservation was favorable (McCallum and Waldman, 1991). The emplacement of the Sloan 1 and 2 kimberlites was structurally controlled. The Sloan 1 was emplaced along the Copper King fault while the Sloan 2 was emplaced along the Prairie Divide fault in the Log Cabin granite (McCallum, 1976). Typically, kimberlite erodes faster than the adjacent granite which results a slight topographic depression. Both pipes continue under Tertiary gravels in the North Fork of Rabbit Creek to the north (McCallum, 1991). The extent of kimberlite under the surficial cover is unknown (Oliver, 1990). Geologists from Superior Minerals Company concluded that both Sloan pipes were emplaced during separate events and were later eroded. McCallum (1976; 1991) however, concluded that both pipes were emplaced during the same event, and interpreted the Sloan 2 to be a blind diatreme. The evidence cited by McCallum supports that the Sloan 2 is a blind diatreme, in that no Paleozoic xenoliths have been found in the pipe indicating the kimberlite did not penetrate the Paleozoic cover during the Devonian. Whereas, the Sloan 1 contains abundant Paleozoic xenoliths along its western flank. The kimberlites are ultrabasic intrusive rocks that have been extensively altered through carbonatization and serpentinization. Minor phlogopite, mantle megacrysts, and cognate and xenolithic nodules from the mantle and crust occur in the kimberlites. The Sloan 1 is dominated by tuffisitic kimberlite breccias typical of diatreme facies, whereas the Sloan 2 is more characteristic of macrocrystic kimberlite breccia typical of hypabyssal facies (McCallum, 1991) (Figure 4). The following descriptions are based on reports by McCallum (1991) and Shaver (1994). DK1 (Sloan 2 phase): As we walk up the side of the hill from the vehicles towards the Sloan 2 adit, numerous fresh samples of DK1 phase kimberlite are scattered around the mine dump. 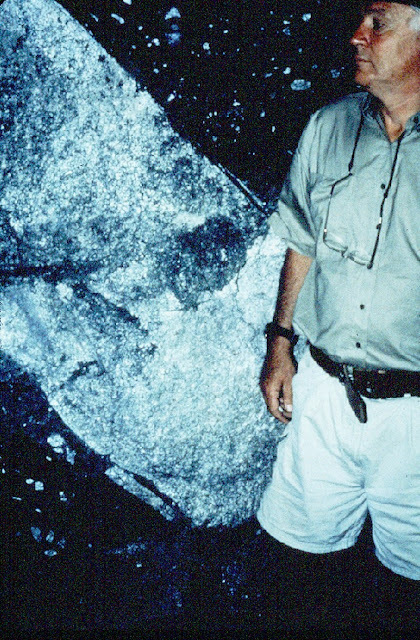 These rocks were exposed by mining operations, as kimberlite did not crop out on the surface of the Sloan 2. The pipe was discovered following heavy mineral sampling (McCallum and Mabarak, 1976). The DK1 phase is a pale-green to black, phlogopite, monticellite, calcite, serpentine, macrocrystic hypabyssal-facies kimberlite breccia, with a phlogopite-serpentine groundmass. Locally, opaques (mostly spinel), perovskite, and apatite may be abundant. Olivine macrocrysts are pervasive and range from fresh to partially altered to completely serpentinized and locally carbonatized rounded grains. Macrocrysts of picroilmenite, pyrope garnet, and chromian diopside are abundant as are mantle and lower crustal xenoliths. This phase forms the northwestern two-thirds of the dike. Geologic map of the Sloan 1 and 2 kimberlites (from McCallum, 1991). DK4 (Light-green spotted phase): Samples of the DK4 phase can be found farther up the hill near the contact with the Sloan 1. This is a pale-green, locally pelletal, lithic tuffisitic transitional phase kimberlite breccia with a serpentine-clay-carbonate matrix. Some light green spots in this phase are the result of calcite-serpentine pools. Macrocrysts of serpentinized olivine are ubiquitous and macrocrysts of picroilmenite, pyrope, chromian diopside, phlogopite, and orthopyroxene are present. Crustal and mantle xenoliths are abundant. Carbonatite xenoliths are also common in this phase, and some are phlogopite-rich sovites. Some of the nodules contain barite. This phase occurs at the southeastern end of the Sloan 2. Three major diatreme facies kimberlite phases were described at the Sloan 1: DK 2 (Black border phase): This is a distinctive, grey to black, tuffisitic kimberlite breccia with a serpentine matrix scattered around some reclaimed pits along the eastern margin of the Sloan 1 pipe. Serpentinized olivine macrocrysts are abundant and locally characterized by a reddish coloration due to finely disseminated hematite after magnetite produced during the serpentinization process of the olivines. Xenocrysts of pyrope, picroilmenite, and chromian diopside are relatively common, and phlogopite and orthopyroxene occur locally. Small xenoliths of Proterozoic granite are abundant, and fragments of Paleozoic sediments are ubiquitous. Sample of Sloan kimberlite with large pyrope megacryst in matrix. Sample from GemHunter's collection. DK3 (eastern green phase): This phase forms much of the Sloan 1 diatreme and can be found near some old reclaimed bulk sample pits. It is a pale-green tuffisitic kimberlite breccia containing abundant secondary serpentine, talc, clay, and carbonate. Unaltered minerals are rare, and macrocrysts and microcrysts of picroilmenite, pyrope, and chromian diopside are widely dispersed. Lower Paleozoic limestone and some granitic and metamorphic xenoliths are common. DK5 (Quarry phase): Located along the western flank of the Sloan 1 diatreme at the site of the old terrazo quarry. This is a dark-green, pelletal, tuffisitic kimberlite breccia with a serpentine matrix. The groundmass includes fine-grained prisms of diopside, phlogopite, and irregular pools of calcite and minor apatite. The abundant pelletal lapilli gives this phase a pseudo-conglomeratic appearance. Serpentinized olivine macrocrysts are abundant and macrocrysts of picroilmenite, pyrope, chromian diopside, and phlogopite are present. Pelletal lapilli vary from a few inches across and are cored with serpentinized olivine, Paleozoic carbonate, or Proterozoic crystalline rock clasts. Kimberlite in the lapilli is generally relatively fresh compared to the kimberlite matrix. Paleozoic carbonate and Proterozoic granite xenoliths can be found. The Paleozoic xenoliths are abundant and vary in size from inches to many feet across. DK6 : Several dikes (< 6 feet wide) of brown, black, to green macrocrystic hypabyssal-facies kimberlite with a serpentine matrix cut the kimberlite breccias. The stability of diamond is constrained by pressure, temperature, and the oxygen fugacity of the host magma. Minimum depths of genesis of diamond-bearing kimberlites are estimated at 95 miles. Garnet lherzolite (peridotite) from the State Line district. Sample from the GemHunter's collection. Most, if not all diamonds from kimberlite are interpreted as xenocrysts derived from the disaggregation of diamondiferous mantle xenoliths during the ascent of the kimberlite. The most important xenoliths are eclogite and garnet-bearing peridotites. Some nodules are very rich in diamond: a hand-specimen of eclogite collected from the Sloan 1 diatreme yielded a grade of 2,100,000 carats/100 tonnes (Schulze, 1992). Typical kimberlite and lamproite ore may only average 10 to 680 carats/100 tonnes. Eclogite consists of clinopyroxene (omphacite) and yellow-orange garnet (almandine-pyrope) with the possible addition of accessory rutile, kyanite, corundum, and coesite. Eclogites are assumed to be cumulates of melts of garnet peridotite or possibly derived from subducted oceanic crust. Some eclogites represent primary host rocks for diamond. This is not only supported by the presence of very rich diamondiferous eclogites, but also by the common occurrence of E-type (eclogitic) diamonds containing eclogitic mineral inclusions in kimberlite groundmass. Such diamonds may contain sodic clinopyroxene and garnet with rutile, kyanite, corundum, and coesite. A genetic relationship between eclogite and inclusion minerals is corroborated by the elevated sodium and potassium contents in garnets and clinopyroxenes, respectively. Garnet harzburgite (peridotite) from State Line district. Most peridotitic diamonds are formed in garnet-bearing harzburgite. Diamondiferous pyrope-lherzolites are uncommon. Diamond grades in the peridotite xenoliths are up to three orders of magnitude higher than the host kimberlites, but are still 2 to 4 orders of magnitude lower than those in the eclogite xenoliths (Helmstaedt, 1993). The majority of the diamonds in the Sloan Ranch complex are E-type diamonds. A parcel of 153 diamonds from the Sloan 1 and 2 yielded 74% E-type diamonds (Otter and Gurney, 1989). Thus, any attempts made to predict the diamond content of these kimberlites based on their G10 pyrope geochemistry would be invalid as the G10 pyropes are only indicative of the garnet harzburgites (Shaver, 1994). The diamonds range from well-perserved octahedra to highly resorbed tetrahexahedra with colors ranging from D to E to some that are very dark brown-yellow (Dummett and others, 1988). Sloan 2 diamonds. This group includes a 5.5 carat gemstone. 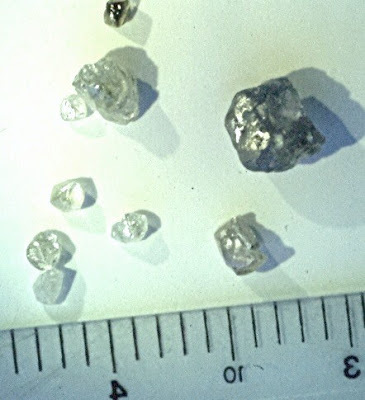 Diamonds from Royal Star Resources. Diamonds from the Sloan pipes range from microdiamonds to a 5.51 carat gemstone (Bernie Free, personal communication, 1994). The 5.51 carat diamond was sent to a cutter and two small 'windows' were polished on its surface. Based on the 'windows' the cutter estimated the diamond would produce a clear, white, brilliant-cut stone weighing at least 2 carats (Shaver, 1994). and dark brown to grey garnet. Sample from the GemHunter's collection. In a recent test, Royalstar Resources recovered a 3,300 tonne sample from a 700 foot adit driven into the Sloan 2 kimberlite. The Sample yielded 9,034 diamonds larger than 1 mm with a combined weight of 342.17 carats for an average grade of 12.68 carats/100 tonnes (Shaver, 1994). Individual samples ranged from 0.72 to 0.22 carats/tonne (Oliver, 1990). The material was processed in the Dia Met mill east of the Sloan 1 kimberlite. The mill was constructed by Superior Minerals in 1982 with a rated capacity of 50 tonnes/day. Resources: The Sloan 1 pipe is estimated to contain a resource of 15,300,000 tonnes of kimberlite at an average grade of 0.06 carats tonne. The Sloan 2 is estimated to contain a resource of 8,400,000 tonnes at an average grade of 0.17 carats/tonne. A transitional phase along the contact between the Sloan 1 and 2 contains 3,800,000 tonnes at an average grade of 0.13 carats/tonne (Oliver, 1990). These resource estimates were made to a depth recoverable by open-pit mining (i.e., to a depth 400 feet). Based on the grades, the Sloan 2 kimberlite represents a potential resource of 1.4 million carats of contained diamonds, and the Sloan 2 (including the transitional phase) represents a potential resource of 1.9 million carats of contained diamonds (Oliver, 1990). These Sloan Ranch kimberlites were of interest to DiamonEx because they represented a potentially economic diamond resource, although small compared to most economic kimberlites in the world. The initial intention was to acquire the Sloan Ranch kimberlites along with the Kelsey Lake kimberlites, place these into production while searching for additional resources. Exposed highwall at the Kelsey Lake diamond mine north of the Sloan Ranch, Colorado and west of Highway 287. The Colorado production would have contributed to the overall proposed production from Botswanna and Colorado. 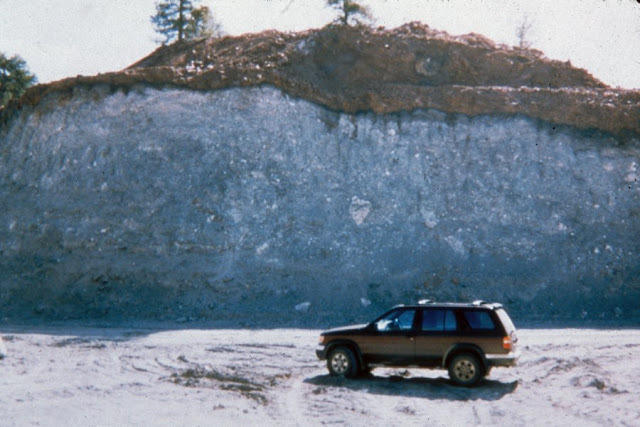 However, the Kelsey Lake kimberlites could not be acquired. Discovery of more than a hundred cryptovolcanic structures with characteristics similar to kimberlite provided evidence for many potentially undiscovered kimberlites within the district and surrounding the State Line district. But because of the encrouchment of housing and cabin sites, this attempt to put the Sloan pipes in production is likely the last attempt. 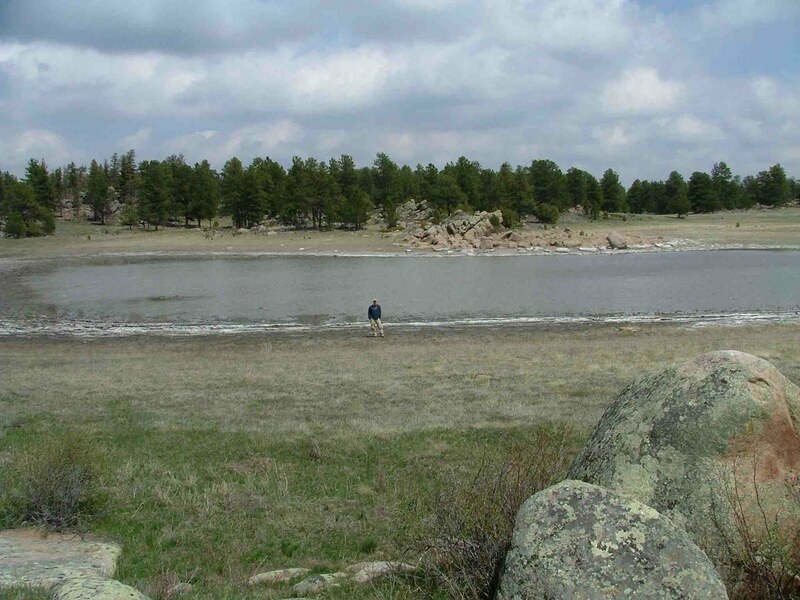 Possibly the best use of the Sloan property would be for the State of Colorado to acquire it and open a state park similar to the Crater of the Diamonds State Park in Arkansas. How difficult is it to find kimberlite? Very! Sometime after the Sloan Ranch trip, I took another field trip for members of the Rocky Mountain Prospectors and Treasure Hunters Club and also the Rocky Mountain Association of Geologists to the Chicken Park Kimberlites located west of the Sloan kimberlites. On this field trip, I told the 50+ geologists and prospectors that I would intentionally walk them across about a 100 yards of kimberlite without telling them - I only indicated that I wanted anyone in the group to let me know when we were walking across the kimberlite (and this is one of the better kimberlite exposures in the district). Not one person saw the kimberlite. So I walked them back across the pipes and dikes to show them what they had missed. 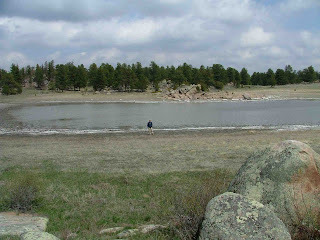 I did the same for another group of prospectors and showed them the kimberlite as well as the dozens of cryptovolcanic structures at Lost Lakes. None of these people recognized the kimberlites or anomalies until I had pointed them out. So is there a major diamond field in this region - I believe there is. So how come no one has found it? It is because few have really looked with an open mind. This happens over and over again in exploration. With the right pair of eyes and open mind, it is highly likely that several commercial diamond mines with by-product colored gemstones will be found in the Colorado-Montana-Wyoming region. Location map of the Kelsey Lake diamondiferous kimberlites. When the author worked for DiamonEx Ltd, I recommended the company to acquire the Sloan 1 and 2 kimberlites, the Kelsey Lake 1 and 2 kimberlites, the Maxwell kimberlite, and all placer ground in the area. After land acquisition I strongly urged the company to develop and mine these properties and continue exploration of the more than 300 cryptovolcanic structures I identified in the region to search for additional diamond resources. At the same time, the company could continue to explore their Botswana properties. Unfortunately, the company lost sight of their goal which was followed by the economic downturn in 2008 sealing their fate. The company did not acquire Kelsey Lake or Maxwell, nor did they explore the placer potential. A short time later I was contacted by a prospector who panned gravels downstream from the Sloan 2 kimberlite and recovered several diamonds including a high-quality 5 carat gem diamond with his pan in an afternoon. For locations of all of these kimberlites and some anomalies, I published many in my gemstone book. Chronic, J., and Ferris, C.S., Jr., 1961, Early Paleozoic outlier in southeastern Wyoming: Rocky Mountain Association of Geologists 12th Field Conference Symposium, p. 143-146. Dummett, H.T., Fipke, C.E., and Blusson, S.L., 1988, Diamond exploration geochemistry in the North American cordillera in Exploration in the North American Cordillera: Joint Publication of the Geological Association of Canada and Association of Exploration Geochemists, p. 168-176. Eggler, D.H., 1968, Virginia Dale Precambrian ring-dike complex, Colorado-Wyoming: Geological Society of America Bulletin, v. 79, p. 1545-1564. 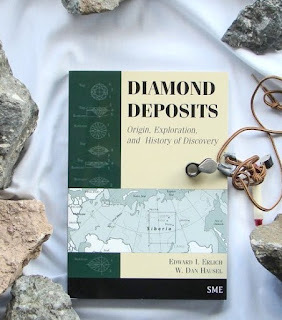 Erlich, E.I., and Hausel, W.D., 2002, Diamond Deposits - Origin, Exploration and History of Discovery. Society of SME. 374 p.
anomalies, this one remains unexplored. Photo by the GemHunter. Gurney, J.J., 1989, Diamonds, in Kimberlites and Related rocks, v. 2, Geological Society of Australia Special Publication No. 14, p. 935-965. Hausel, W.D., 1995, Diamonds, kimberlites, lamproites, and related rocks in the United States: Exploration and Mining Geology, v. 4, no. 3, p. 243-270. Hausel, W.D., 1996, Recurring kimberlite and lamproite magmatism in the Wyoming craton-an overview: Geological Association of America Abstracts /Programs, Rocky Mountain Section. 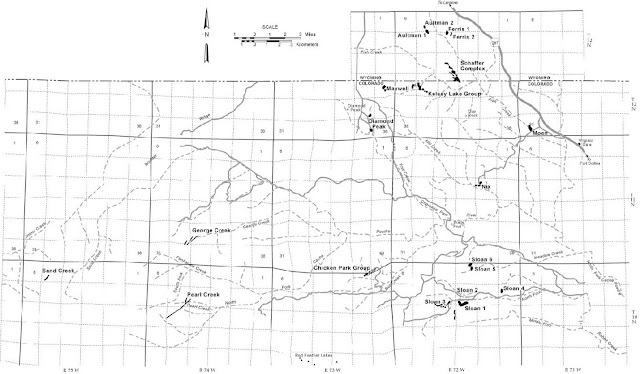 Hausel, W.D., 1998, Diamonds & Mantle Source Rocks in the Wyoming Craton with Discussions of Other US Occurrences. WGS Report of Investigations 53, 93 p.
Hausel, W.D., McCallum, M.E., and Woodzick, T.L., 1979, Exploration for diamond-bearing kimberlite in Colorado and Wyoming: an evaluation of exploration techniques: Wyoming State Geological Survey Report of Investigations 19, 29 p.
Hausel, W.D., and Stahl, Sandy, 1995, The "Great Diamond Hoax of 1872": Wyoming Geological Association Field Conference Guidebook, Resources of Southwestern Wyoming, p. 13-27. Helmstaedt, H.H., 1993, Natural diamond occurrences and tectonic setting of primary diamond deposits in Diamonds: Exploration, Sampling, and Evaluation: Prospectors and Developers Association of Canada, p. 3-74. Karlstrom, K.E., and Houston, R.S., 1984, The Cheyenne Belt: analysis of a Proterozoic suture in southern Wyoming: Precambrian Research, v. 25, p. 415-446. Larson, E.E., and Amini, M.H., 1981, Fission-track dating of the Green Mountain kimberlite diatreme near Boulder, Colorado: The Mountain Geologist, v. 18, no. 1, p. 18-22. McCallum, M.E., 1976, An emplacement model to explain contrasting mineral assemblages in adjacent kimberlite pipes: Journal of Geology, v. 13, p. 673-684. McCallum, M.E., 1991, The Sloan 1 and 2 kimberlite complex near the southern boundary of the State Line district of the Colorado-Wyoming kimberlite province: Wyoming Geological Association 42nd Field Conference Guidebook, Mineral Resources of Wyoming, p. 229-250. McCallum, M.E., and Eggler, D.H., 1971, Mineralogy of the Sloan diatreme, a kimberlite pipe in northern Larimer County, Colorado: American Mineralogist, v. 55, p. 1735-1749. McCallum, M.E., and Eggler, D.H., 1979, Field guide for the Sloan and Nix kimberlites in the southern portion of the Colorado-Wyoming State Line district: Geological Society of America Guidebook for the 32nd Annual Meeting, Rocky Mountain Section, p. 181-209. McCallum, M.E., and Mabarak, C.D., 1976, Diamond in State Line kimberlite diatremes, Albany County, Wyoming and Larimer County, Colorado: Wyoming State Geological Survey Report of Investigations 12, 36 p.
Sloan kimberlites along Rabbit Creek (photo by the GemHunter). McCallum, M.E., and Eggler, D.H., Coopersmith, H.G., Smith, C.B., and Mabarak, C.D., 1977, Field guide, Colorado-Wyoming State Line district: Second International Kimberlite Conference, Santa Fe, N.M., 23 p.
McCallum, M.E., Mabarak, C.D., and Coopersmith, H.G., 1979, Diamonds from kimberlites in the Colorado-Wyoming State Line district: in Kimberlites, Diatremes, and Diamonds: American Geophysical Union Second International Kimberlite Conference Proceedings, p 42-58. McCallum, M.E., and Waldman, M.A., 1991, The diamond resources of the Colorado-Wyoming State Line district: kimberlite indicator mineral chemistry as a guide to economic potential: Wyoming Geological Association 42nd Field Conference Guidebook, Mineral Resources of Wyoming, p. 77-90. Naesser, C.W., and McCallum, M.E., 1977, Fission-track dating of kimberlitic zircons: Extended Abstracts, Second International Kimberlite Conference, Santa Fe, N.M.
Oliver, D.H., 1990, Prairie Divide Properties Corporation, Sloan Ranch diamond project, Larimer County, Colorado summary report: Unpublished Consultant's Report prepared for Prairie Divide Properties Corporation, 29 p.
Otter, M.L., and Gurney, J.J., 1989, Mineral inclusions in diamonds from the Sloan diatremes, Colorado-Wyoming State Line kimberlite district, North America in Kimberlites and Related Rocks, v. 2, Carlton, Australia, p. 1042-1053. Peterman, Z.E., Hedge, C.E., and Braddock, W.A., 1968, Age of Precambrian events in the northeast Front Range, Colorado: Journal of Geophysical Research, v. 73, p. 2277-2296. Rogers, J.A., 1985, Kimberlite exploration, Red Feather area, and petrology of the Chicken Park diatreme, northern Colorado: M.S. Thesis, Colorado State University, Ft. Collins, 268 p.
Schulze, D.J., 1992, Diamond eclogite from Sloan Ranch, Colorado, and its bearing on diamond grade of the Sloan kimberlite: Economic Geology, v. 87, p. 2175-2179. 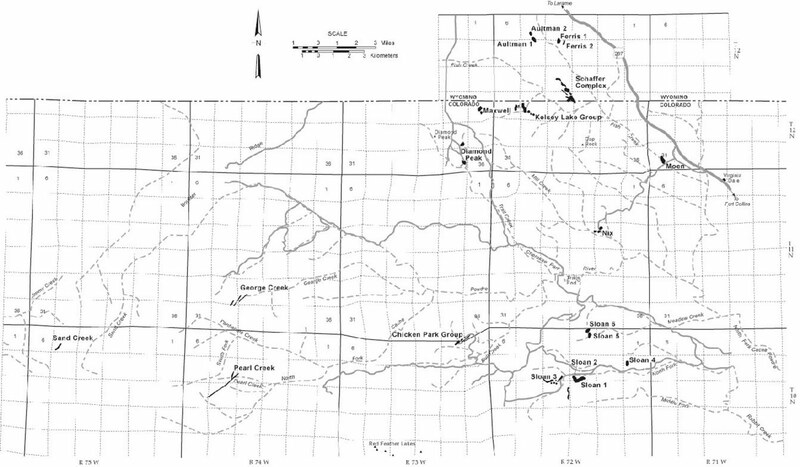 Shaver, K.C., 1988, Exploration of the Sloan Ranch complex: a diamondiferous kimberlite prospect in northern Colorado: Mining Engineering, v. 40, no.1, p. 45-48. Shaver, K.C., 1994, Phase I underground exploration and mill testing of the Sloan Ranch diamondiferous kimberlite complex, Larimer County, Colorado: Unpublished Consultant's report prepared for Royalstar Resources Ltd., Vancouver, B.C., 39 p.
Smith, C.B., 1979, Rb-Sr mica ages on various kimberlites (abstract): Kimberlite Symposium II, Cambridge, England. Smith, C.B., 1983, Rb-Sr, U-Pb, Sm-Nd isotopic studies of kimberlite and selected mantle-derived xenoliths: PhD dissertation, University of Witwatersrand, Johannesburg, South Africa, 436 p.
Smith, C.B, McCallum, M.E., Coopersmith, H.G., and Eggler, D.H., 1979, Petrochemistry and structure of kimberlite in the Front Range and Laramie Range, Colorado-Wyoming in Kimberlites, Diatremes, and Diamonds: American Geophysical Union Second International Kimberlite Conference Proceedings, p 178-189. Waldman, M.A., 1991, Guide to Dia Met Minerals' diamond recovery plant near Sloan Ranch, Colorado: Wyoming Geological Association 42nd Field Conference Guidebook, Mineral Resources of Wyoming, p. 251-257. Wow, Can you believe it! I found this kimberlite sample right here in Arizona! Not only that, it was in my rock garden in my back yard. And even more incredible, the rock must have labeled itself as it has a label on the other side! What next? Actually, I brought it from Wyoming when I moved and threw it in my garden. Want more information, follow my website at GEMHUNTER and Like us on FACEBOOK. Like us on Facebook and follow us on Gem Hunter and learn more about gemstones and gold. And check out some great books on finding gold, diamonds, minerals and rocks. Learn how to find $billions in gemstones, diamonds & gold using a little geology. I hope you may continue to keep in posting new posts & thank you for sharing your great experience among us. It is really nice article about our subjects, thanks for sharing this information. Your The Man !!! Thank you!!! I LOVE This Stuff!!! Kimberlite, one of the principal host rocks for diamond, is found at the Sloan Ranch. Here, two of the better prospects in the State Line district are found & the two pipes contain a known diamond resource that could be worth several hundred million to more than a billion dollars. Several years ago, the author led field trips to this & nearby kimbelites for the public & various professional geological associations.